Good ol' Review – Kamen Rider Drive: Surprise Future – Enjoyable Disappointment? WARNING! Major spoilers for both movie and series! Since seeing the trailers and that little end of episode miniseries featuring Tomari Eiji, I’ve been very excited about seeing Kamen Rider Drive: Surprise Future. Mainly, I was looking forward to seeing a story that could’ve potentially helped the series be fuller and more complete. But just like the series, the movie dropped the ball. Kamen Rider Drive has been all about wasted potential. And that’s quite a shame. I enjoyed and liked Kamen Rider Drive. But I wanted to love it. Unfortunately, the memory of wasted potential and missteps during the season will always come back and sadden me. Still, I went into this movie hopeful that we’d at least get something epic and fun. The basic plot of the movie is pretty good and could’ve easily filled at least a third of the series itself. Belt-san being corrupted and used for evil by his own creations. They could’ve blended that together with Banno’s story too to actually give him purpose instead of just being an easy out as the big bad of the series. The movie played on Krim being sketchy and secretive all the time and the plot of this movie would’ve worked to help develop and deepen his character in series. Strangely enough, the movie had a much better balance of actual police work and the more emotional character-driven stories than the series. Those are some of the positives for me. But the movie was very rushed. Again, the plot could’ve filled out a big chunk of the series. So cramming it all into a one-hour movie really shortchanged a lot of the potential. Every big Kamen Rider and Super Sentai movie has the requisite decisive clusterfrak of a CGI battle. But I feel like this movie had more than usual CGI and henshined fight scenes. And in turn, we only got a small cameo form Heart, Brain and Medic while the rest of the SID (Chief Jun, Rinna, Otta and Kyu) were mere bit players who didn’t even get time to react to Shinnosuke’s “death” or being a wanted man. 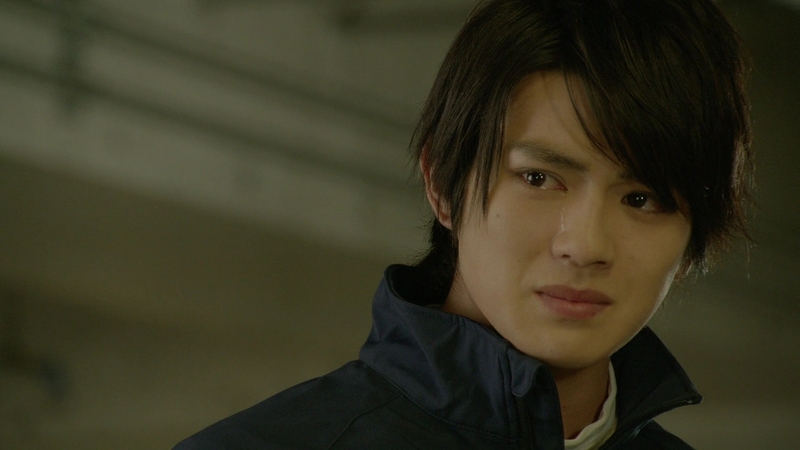 One of the biggest bits of wasted potential is Tomari Eiji, played excellently by Mackenyu. Mackenyu seems to be a talented young actor (from the US!) and he definitely ran with the little material he was given here. The movie started out with some excellent and surprisingly effective scenes between Eiji and daddy Shinnosuke. I think it had a lot to do with Mackenyu being very charismatic and having a nice little chemistry with Takeuchi Ryoma. You immediately believed they really were father and son (from the future). Scenes of Shinnosuke and Kiriko later on were also great and were examples of scenes we should have had more of in series. Overall, the plot resolved itself fine. And the new forms and toys were nice and pretty. I really don’t understand why, but even while I have many criticisms and disappointments with Kamen Rider Drive (I continue to use it as a point of comparison in reviews of Ghost and even Ninninger), I still had fun watching it. And not in a “hate watch” kind of way. I legitimately enjoyed it. And that goes for this movie as well. Plenty of wasted potential, but still somehow enjoyable to watch. ← Recap: Power Rangers Dino (Super) Charge, Episode (4) 24 – "My headache's getting worse."